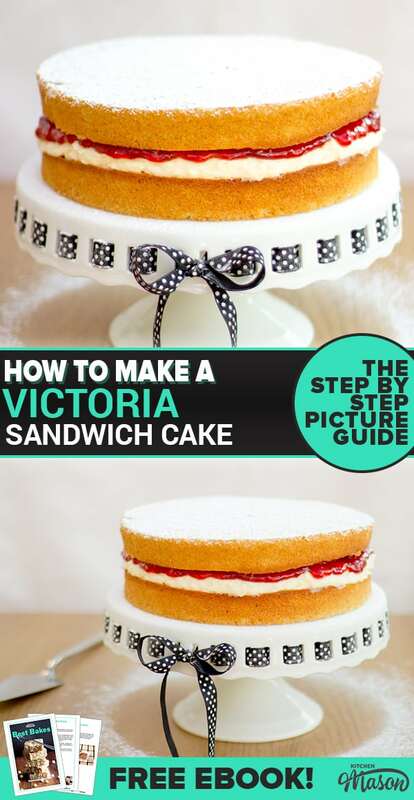 Who doesn’t love a Victoria sandwich cake eh?! I know I certainly do. This may come as a surprise but I’d actually rather pick a slice of this over a great big slice of chocolate cake. Seriously! 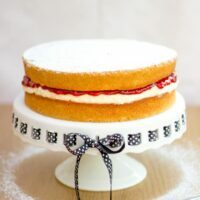 There’s just something so simple and classic about a Victoria sponge cake, I just love it! In fact, I love it equally as much as this luxurious rhubarb and custard cake. Which is also an amazing and classic combo. Ok ok, I’m basically just addicted to cake! 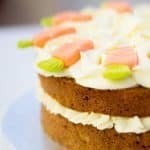 While we’re on the subject of classic cakes, have you seen my ultimate carrot cake recipe? You should totally go and check it out, the cream cheese frosting is incredible! 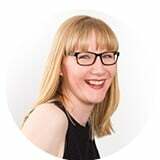 In other news, it’s Mother’s Day this Sunday & I’m quite excited as it’s the first one I actually qualify for! Although I’m of the firm opinion that we should appreciate our Mums all year round, I also think it’s nice that we set aside a day to really spoil them rotten. And what’s the best way to do that? With cake of course! 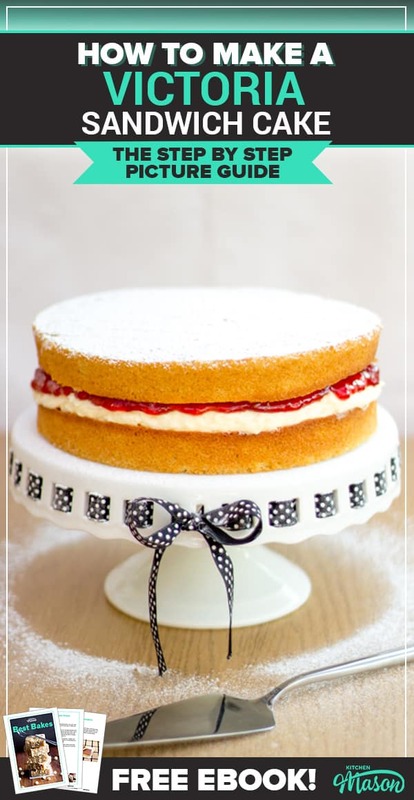 This brilliant ‘back to basics’ recipe for a classic Victoria Sandwich Cake is so simple. It’s perfect for Dads & kids to team up and really put a smile on Mum’s face this weekend. Much like my lemon cake recipe, it’s what we call an ‘all in one’ cake recipe. You literally just dump all the cake ingredients into a bowl, mix it and you’re done! It couldn’t be more simple. Have all your ingredients at the same temperature. I.e. take all refrigerated ingredients out the fridge an hour before using. 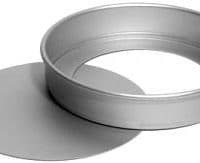 This will not only make them easier for you to use (particularly the butter) but it will blend much better and create a more even texture throughout your cake. There’s no need to line the sides of the tins, only line the base. Bake cakes in the lower part of your oven to prevent doming in the middle. Don’t open the oven door until right near the very end of the cooking time (when you need to check for doneness with a skewer) as you could cause the cake to collapse! Turn the top sponge layer upside down before placing onto the jam. This will give you a perfectly flat top and no one will be any the wiser! NEVER store cake in the fridge. It draws out the moisture and makes it really dry. So, here is what you will need to make a 20cm (8″) cake. Now, lightly grease the base & sides of your cake tins & line the bases with baking paper. 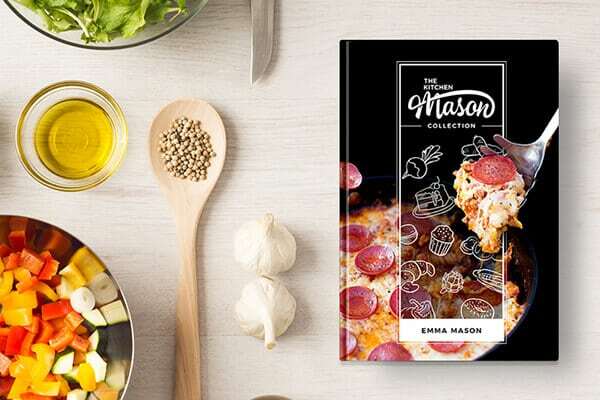 Either in an electric stand mixer or a large bowl with an electric hand whisk – add in all the sponge ingredients & mix together until smooth & lump free. Divide the batter evenly between the two tins & smooth with a spatula. To prevent the cake from doming so much in the middle – put a ‘dip’ in the centre of the batter. Place in the lower part of the preheated oven (preferably on the same shelf) for about 15-20 minutes or until a skewer inserted into the centre comes out clean. Leave to cool in the tins for 10 minutes. Then slide a pallet knife around the sides of each cake to loosen, remove from the tin, peel off the baking paper from the base & leave to cool completely on a wire rack before decorating. Increase the speed and beat until light and fluffy. (At least 3-4 minutes.) Scrape down the sides of the bowl periodically and if you need to loosen the mixture a little – add a splash of milk and continue to mix. 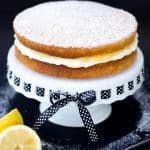 Once the sponge layers have completely cooled, place one layer onto a cake stand. If you need to, level the top by slicing any domed cake off with a large, sharp knife. Then smear the buttercream evenly all over the top, right to the edges. Top with the jam and spread out evenly. Not quite right to the edges, but close. 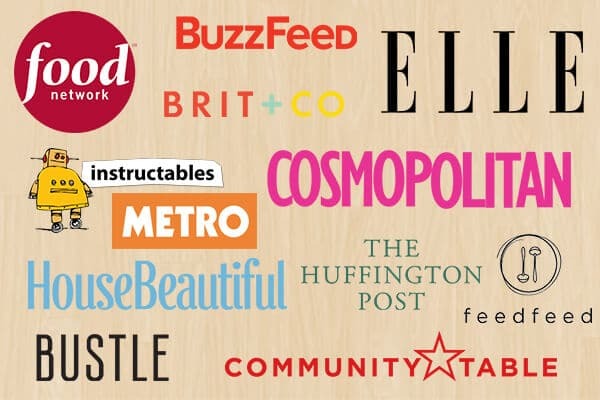 Remember this will squash outwards slightly when you put the top layer on. When you’re happy with that, top with the remaining sponge layer. I like to level any dome and use the bottom side to give a nice flat edge. But it’s entirely up to you. Place a heaped teaspoon or two of icing sugar into a sieve, then generously sprinkle all over the top of the cake. Store in an airtight container and eat within 2 days. I told you it was easy! I love the all in one sponge method. It’s so simple & quick that anyone can do it! Yes, even those of you who claim you can’t bake – you can do it too! So here’s to all you wonderful Mums out there that put up with our dirty washing, our bad tempers and untidy bedrooms, yet still (somehow!) love us unconditionally. You are all incredible and I hope you are showered with appreciation and love this Sunday, because you deserve it. 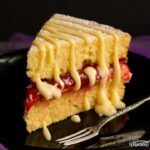 This super simple 'all in one' Victoria sandwich recipe will become a firm household favourite, I guarantee it! Grease the base and sides/line the base of the two sandwich tins and preheat your oven to 190°C/Fan 170°C. Put all the sponge ingredients into an electric stand mixer and beat until just blended. Divide the batter between the two sandwich tins and bake on the lower shelf in the preheated oven for 15-20 mins until a skewer inserted in the middle comes out clean. When cool enough to handle, remove the cakes from the tins, peel off the baking paper and place on a cooling rack to cool completely before decorating. 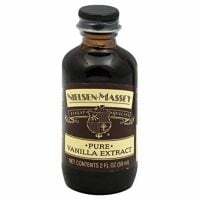 Weigh the butter, icing sugar and vanilla extract (optional) into an electric stand mixer. Beat on slow until the icing sugar has dissolved then beat on high for a couple of minutes until light and smooth. Place the jam into a small bowl and mix with a spoon to loosen. If your cakes have domed at all, level them out with a sharp knife. Then place one of the sponge layers onto a serving plate or cake stand. Spread the buttercream evenly over the top then smooth over the jam. Dust generously with icing sugar before slicing and serving. Store at room temperature and consume within 2 days. Reblogged this on Tasty Relax. Love this! Congrats on making it to the first Mother’s Day! This is just the perfect Mother’s day cake! and so perfect to accompany a good cup of tea in the afternoon.. you definitely have got me craving a slice now.